Professional website designs that balance creativity with your desired business goals. Your search for high quality website designs in Australia ends here. Get visually appealing web designs tailored for your business. "Why do I need a website?" Your website is the first place your customers go to research your business and your products or services. It is a crucial part of marketing your business in today’s information age. People are after information and they expect you to provide it to them quickly. Your website is the most cost effective way of promoting your business around the clock. Whether customers are online window shopping, evaluating your business or spending money with you, your website will be one of the cornerstones of your successful business. "I already have a site but it isn’t working for me." Is your current website outdated, is it achieving what you want it to achieve? Is it generating leads for you or generating sales? Do you make it easy for your customers to buy form you? Or do you simply want to attract new customers? The most important step in creating your new website is not the design, it is setting the goals you want to achieve and the metrics you are going to put in place to find out if you’re meeting them. 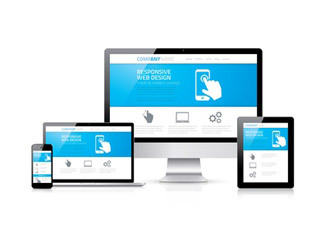 Our Website Redesign service can help you if you have an existing site that needs redesigning. "What are the different types of websites"
Websites come in a number of forms, the most common of which are below. You might require a site that has one or a few of the forms. Landing pages for marketing campaigns, promotions or opt in pages that are usually 1-2 pages. A structured way to present articles that typically allows users to add their opinions to the articles. Also know as an e-commerce site, the site’s purpose is to sell products or service online. It showcases products, allows users to provide feedback and can even recommend products based on purchasers behaviour. Sharing sites allow users to share content and connect to each other, popular examples are Facebook and Linked in. Social network sites have grown immensely in popularity as the standard way people interact in recent years. Directories create a meeting place for 2 groups, those looking to promote their products or service and those looking to find products or services such as Yellow Pages. Need some help deciding? One of our experts at Complete Cloud can help you determine which type of site is right for you. "What is involved in setting up my website?" At Complete Cloud we guide you through the website process step by step and support you along the way. We take the stress designing and building your website with our simple and effective approach. Goals: we start by understanding your business and the goals you are trying to achieve. Content: we help you to create engaging content that will capture your audience. Design: We put ourselves in your customers shoes and design a website with a knockout experience. Prototype: we create a prototype to allow you to see what your site will look like before we build it. This will make sure that the final website we build for you is exactly what you want. Test: After we build your website, you have the opportunity to test it out to ensure it will work for you the way you intended. Launch: Once you are happy with your website, it’s time to put it to use. We help you create an effective launch that will generate an ROI for your business. The delivery of your website will depend on its size and complexity along with our current schedule. The majority of our websites are built in a matter of weeks not months. If you have an urgent requirement, an imminent launch or just can’t wait for your new website, get in touch with us regarding our project fast tracking service. "I am having trouble writing my content, can you help me?" It is quite common for our clients to take longer to write the content for their website than it takes us to build the website for them. Writing website content is different to writing traditional sales content. Online users have a short attention span so you need to ensure that the copy is direct and to the point but also engaging. If you need help with your website copy, get in touch and our writers would be happy to write engaging effective content that will increase your conversion rates. "Can I update my website myself?" Our standard websites have an easy to use content management system (CMS) that provides you with full control of your website. We understand that some things change in business quite regularly and your CMS will allow you to make changes to content whenever you need to. "Is there any training provided with the CMS?" The CMS (content management system) is very intuitive and really easy to use. As part of deployment of your website we arrange a training session to take you through the CMS for your website.We are also available for support if you ever run into issues or have any questions. We can also provide you support on how to get the most out of your website and ensure it is working for you the way you intended it to. "How do I get people to visit my website?" Your website, like a physical store, will only benefit you if your customers know about it. To get your store out there, you can use traditional media or online marketing such as email marketing, PPC, SEO and social media. Online marketing provides you with a cost effective way to communicate and build relationships with your clients and increases your chances of achieving your goals. "Can I report on people visiting my website?" Your website will provide you the ability to view reports on the number of visitors to your website and how they got there. Among other report you can view the most popular pages on your website and how long customers spend reading each page. For advanced reporting you can integrate your website with Google Analytics which will provide further in depth statistics on your website. You can use this information to feed into your future SEO and marketing campaigns to ensure you are spending your marketing budget on areas of your business that generate income for you. Your website comes with a hosted email package that allows you to manage your personalised emails professionally for your business. You can set up multiple email addresses for individuals or for parts of your business such as sales@YourBusiness.com.au, info@YourBusiness.com.au or john.smith@YourBusiness.com.au. "Why would I choose Complete Cloud?" At Complete Cloud we are focused on your success. We provide solutions that meet our clients individual needs to ensure your business gets the most out of its technology. Our solutions are cost effective as we get solutions right for our customers the first time, which saves them valuable time and money re-working solutions that don’t meet their needs. We only employ the best people in their field as your website is probably your most important communication channel and you want to provide your customer with the best interaction with your business. Complete Cloud can create a website that instills confidence in your customers, helps you rank high in search engines and meets your businesses goals.